The Power Automedia crew jumped a plane from So Cal to take part in this year’s Heidts Performance Car Challenge held at the Autobahn Automotive Country Club in Joliet, Illinois. The HPCC event is the culmination of Heidts and close industry partners coming together to give the midwest and east coast a long overdue performance event to test and challenge every level of driver and vehicle. Purpose-built with both the beginner and the pro in mind, Jet Hot came on board with an auto-cross school course where you could test and sharpen your skills to get both your comfort level and your skill set up to go out and compete with the big guns. Check out this trifecta of performance automotive mayhem heaven in the video above and see for yourself why we were smiling ear to ear all weekend long. This was no run and gun one-day event for locals only. The crew at Heidts opened up their all-new facility creating a great atmosphere for those who traveled a long distance and looking for a stress-free weekend of adrenaline pumping action. On Friday, the Heidt’s team held shop tours through their facility, with a “nothing’s off-limits” philosophy. We toured the grounds and got to see everything from the machine work to all of the in-house weldors doing what they do best! After walking 50,000 sq. 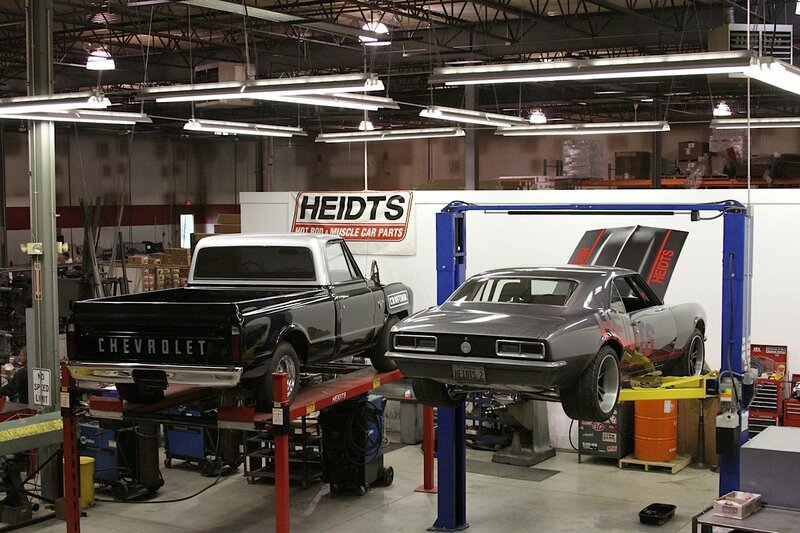 ft. of high-tech engineering at it’s finest, we could easily see why Heidts prides themselves on quality parts matched with top-class customer service. With tours going all day long, it was come as you are and casual so if you missed one tour due to some bench racing outside with your buddies, it was no big thing and you could easily walk in and catch the next group. As appetites were building, the smell of Chicago BBQ filled the air. Heidts brought in catered BBQ for all of the event attendees, come one – come all. Both bellies and minds full of all the goodness to be had, it was time to get everyone registered. Heidts brought registration to their facility to ensure that everything could be done the day before with no hassle so when Saturday morning rolled around there wouldn’t be any waiting and entrants could fire right up and hit the track. Heidts also had their own race-weekend prep to attend to as they worked feverishly around the clock for the last week to get their ’68 Camaro out on the track. This “Heidts Test Car” was built to showcase exactly what you could do with off-the-shelf Pro-G equipment. Literally prepped and being run for the first time, we were all excited to see what this bad boy could do! 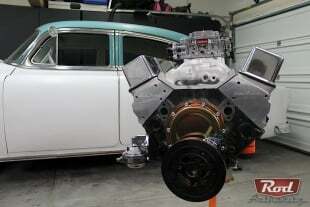 Running for the very first time, the Heidts '68 Camaro test rig was equipped and ready to compete! After the shop tours, lunch, and festivities it was time to hit the Road Rally and head to the host hotel in Joliet, IL located near the Autobahn track where there was more fun in waiting. That night they opened up a reception and go-karts for all of the HPCC attendees to have a little fun before Saturday’s events kicked off. We tall ya, this crew really knows how to put on an event! “We built an event that we would want to participate in ourselves…” Heidts Director of Engineering, Jim Shaw, shared with us. “Something that is a ton of fun, but also challenging,” and this philosophy carries thoughout the entire staff at Heidts and everyone involved with the event and it really shows. Hosted by Bill Howell and the American Street Car Series team, the HPCC event featured three different areas for competitors to put their rides to the test. The Wilwood Speed Stop Challenge, The Jet Hot AutoCross, and the Heidts Road Course all tested the best drivers and the best cars from coast to coast. Saturday morning the racing action kicked into full swing at the Autobahn Country Club. The smell of racing gas, fresh rubber, and perfect summer weather filled the air as drivers prepped for the big day ahead. The Heidts Road Course portion of the event took place on the North course which is a 1.46-mile, nine turn, adrenaline factory where drivers test their skills and machine full throttle. An entire day on the road course assures everyone gets plenty of track time to put up their best time after plenty of trail runs and learning the course. The Autobahn Road Course was the perfect course to challenge both novice and pro - pairing talent and machine in a battle royal all weekend long. After two full days of racing the North course on the Autobahn the fastest lap time went to Danny Popp in the Z06 Corvette clocking in at a lighting fast 104.774. The Jet Hot AutoCross allows drivers to test their skills against the clock and the challenging cone designated course designed to test all facets of performance driving. The key to this event is the hosted driver school that anyone can attend if they are one of the first 20 to sign up for the Heidts Performance Car Challenge. Auto-cross racers are opted in for the school which is conducted by professional race drivers teaching technique and tips to every level of driver in attendance. There is no extra charge for this instruction which provides helpful input for both beginner and novice racers to get the most from this once-in-a-lifetime opportunity. This encouraged drivers and entrants to register early and line up to take advantage of this one-on-one instruction. The Jet Hot AutoCross proved to be the ultimate measure of both driver skill and pushing suspension components to the max. In the end Tim McGilton won the exciting shootout and Danny Pop put down the best lap time of 35.183 in the Heidts '68 Camaro. Hit a cone and the time penalty could kill your chances of making a ranking pass. This was one of the weekend’s more challenging events really testing every level of performance driving. AutoCross, Speed Stop Squared and racing on the Autobahn North course continued both Saturday and Sunday. The two events that were a Saturday only affair and closed on Sunday due to the final shootouts were the auto-cross school and the car show. With a trifecta of ultimate performance musclecar driving we were going crazy bouncing from one awesome event to the next. We were even lucky enough to take a few laps ourselves which brought the weekend to an all-time high! The Speed Stop Squared was quite the heated battle, but in the end Danny Popp busted out the best time with a 7.955 in the Heidts Camaro with Randy Johnson coming in a close second at 8.306. The Heidts Performance Car Challenge also included a Car Show showcasing some of the most beautiful automotive craftsmanship on the planet. Awards were given to the winner of each class, and the expert panel of judges selected a Best of Show along with an editor’s choice class. The entry fee for the car show was only $25 and included three parade laps around the track which was definitely a highlight for the car show entrants. Those interested in just coming out and showing off their pride and joy but relaxing in the shade and their lawn chair to take in the sights and sounds were more than welcome. The specific car show entrant area still allowed all car show participants to spectate all three of the other events (providing they obeyed the spectator rules and didn’t cross any barriers). 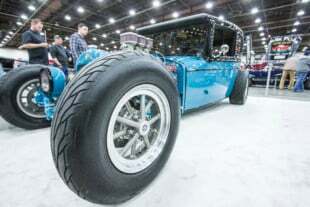 There were also plenty of vendors set up on hand in both the car show area and in the “pit row” offering everything from the finest in custom wheels to chassis and suspension components throughout the weekend offering special discounts for all weekend long for event participants. Forgeline Wheels, Heidts, Wilwood, and others were on hand offering special event discounts to all event participants. Over 100 car show cars came out polished up and ready to check out fellow show cars in all of their glory. Everything from Jack Ester’s 1956 Chevy Custom to restored Fox body Mustangs and everything in between was on hand for the enjoyment of all. Even the road course drivers walked through the car show to appreciate the shiny chrome and custom details throughout. Over 100 show cars came from all over the eastern states to join in on the fun! Pro driver Danny Popp chatting it up with Heidts Engineer, Jim Shaw. Trophies were presented to the top winners of all three events. Definitely an amazing and action packed weekend, we were glad we got to witness firsthand! If you’ve never been to one of these musclecar performance events you really need to get out and check one out for yourself. For more info – check out www.Heidts.com and mark your calendars to be a part of next year’s HPCC event.